The finished Thomas Jefferson portrait bust. A new sculpture created by University of Lynchburg art professor Richard Pumphrey ’74 was unveiled Saturday during the Thomas Jefferson Wine Festival at Poplar Forest. The life-size portrait bust of Thomas Jefferson captures the third president’s selflessness and devotion to public service, said Richard. He and his wife, Dr. Kathryn Mitchell Pumphrey ’75, donated the sculpture to the Corporation for Jefferson’s Poplar Forest, the organization that preserves the octagonal home that Jefferson designed for himself near Lynchburg. 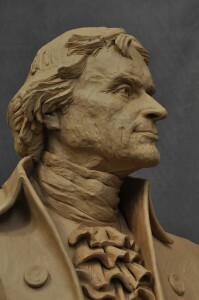 Richard Pumphrey’s Thomas Jefferson bust in clay state. Since the 1980s, the Pumphreys have attended numerous lectures on Jefferson’s life, and Kathryn has developed a large library of books about the author of the Declaration of Independence. They frequent Monticello, Jefferson’s home near Charlottesville, and the University of Virginia, which boasts numerous examples of Jeffersonian architecture. Richard thought of sculpting Jefferson and donating the work to Poplar Forest when he and Kathryn discussed what he should work on between other commissioned projects. Early in 2014, he started researching more about Jefferson and spending a lot of time studying existing artwork showing the president in various stages of life. He finished the sculpture later that year. 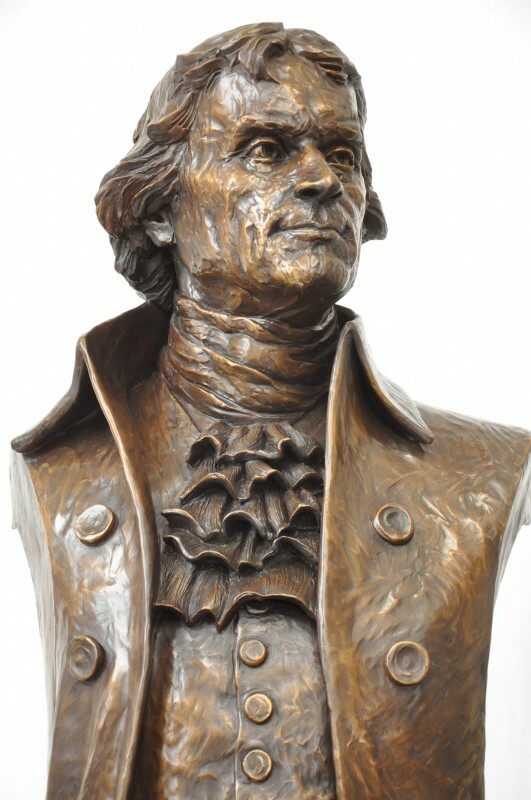 The bust depicts Jefferson in his late 50s, just before the start of his first term as president. “It was my intent to show him as a visionary, to make him seem very purposeful, to show his strength of character and his strength of purpose in giving himself totally to the nation and to the state of Virginia,” Richard said. A picture of the sculpture is now the profile image on the Poplar Forest Facebook page.